A little bat, a lot of cute! There are very few good images of Kitti’s Hog Nosed bats, so please enjoy an E Wright portrait from 2014! To see great photos, please check out the gallery at Merlin Tuttle’s Bat Conservation. Hi everyone! I hope you all had a good week! I had an eventful one. My sister graduated from high school on Thursday! In honor of her graduating, I thought I would write about one of her favorite bats. She loves the little Bumble-Bee Bat. The Bumble-Bee Bat is not only one of the cutest animals I have ever seen, it is also the smallest mammal known to man. This makes it the smallest bat species. The official name of the Bumble-Bee Bat is the Kittie’s Hog-Nosed Bat, but since it’s only an inch long, people nicknamed it the Bumble-Bee Bat. This bat has red or gray fur, big ears, a cute tail, extra webbing between its hind legs, and true to its name, a cute hog-ish nose. The extra webbing between their legs helps them move around while they are flying. The Bumble-Bee Bat lives along the Southeast part of Burma, the western areas of Thailand, and the Sai Yok National Park in Thailand. They roost along the forest areas and the limestone caves by rivers. Their diet consists of insects that live near the water. They eat a lot of flies and also eat spiders. Unlike a lot of other bat species, these bats don’t live in large colonies. Their colonies usually only have between 100 and 500 members, sometimes even less. Some colonies only have 10 bats as members. 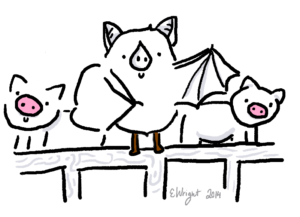 If you’d like to read more about these adorable bats, you can find information here. Next StoryRed light means go! If you’re a bat.